ANZAC Day Wreaths, Anzac Floral Wreaths Auckland New Zealand. Thanks so much, that looks amazing. I live in gold coast, so this is awesome, it will be a surprise for my friend when she receives it, thank you so much. Have a fabulous week. Wreaths for Anzac Day - 25th April, carefully made by our Professional Florists using traditional techniques, an Anzac wreath is covered with long- lasting fresh glossy green leaves, arranged in the historical format designed to emulate a traditional laurel wreath used by the Ancient Romans to crown victors and the brave as a mark of honour. This beautiful green symbolic wreath can then be highlighted with ribbon, symbolic R.S.A. Red Poppies or a floral focal area. We can also make formal floral tributes for laying at the Cenotaph and remembrance services in Auckland. YES - we can do special prices for Bulk Orders to one address. Please call Jo to discuss the details you need. 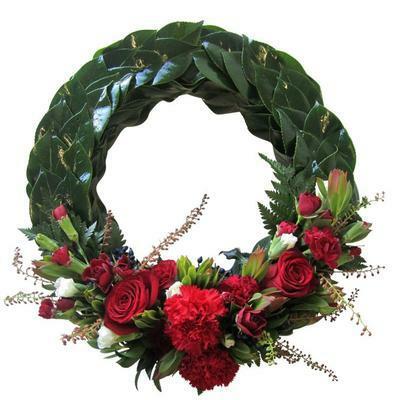 If you are requiring your own unique ANZAC Day flowers in either a traditional wreath style or a more modern design then please do call our Professional Florists direct on 09 838 9058 to discuss your needs, we would be honoured to help.